Volkswagen’s Golf lineup seems to have a model that appeals to your needs. Want basic hatchback? There is the regular Golf. What about something a bit sporty? That’s where the Golf GTI with either 210 or 220 horsepower on tap comes on. Need a bit more space? Both the Golf SportWagen and Alltrack that bring additional room for cargo. The Golf Alltrack also features a tweaked all-wheel drive system and raised ride height to provide all-weather capability. But what if you want the big daddy of the Golf lineup? The one that can put on a show. That’s where the hyper Golf R steps in. The elephant in the room when talking about the Volkswagen Golf R is the Ford Focus RS. 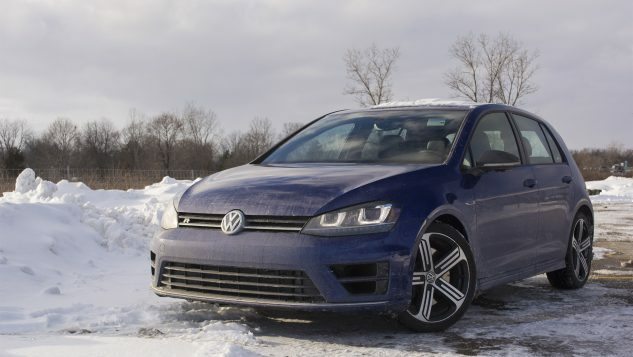 Not only does it boast more power than the Golf R (350 horsepower and 350 pound-feet of torque), it features a clever all-wheel drive system with a drift mode. The Focus RS also stands out with an aggressive body kit. But Focus RS has one of the stiffest rides in the class. Subaru’s WRX STI offers a bit more power than the Golf R, along with a wild look and the ability to adjust the amount of power being sent to the rear wheels via a dial. But like the Focus RS, the WRX STI doesn’t have the same quality feel inside like the Golf R. The WRX STI also loses points as it is only offered in a sedan. The 2017 Volkswagen Golf R might not look like a hyper hatchback. But that might be its greatest strength. Underneath the understated looks lies one of the most capable performance cars on sale with an amazing all-wheel drive. Add in the plus points of the standard Golf such as the well-appointed and spacious interior, and non-jarring ride, and you have one of the most well-rounded performance vehicles on sale. But be prepared to spend some cash to get it. Find out more details about the 2017 Golf R in the full review HERE.